That’s me in the reflection. The work with the redesign of the Apegroup website continues. We now have an allocated time and a name for the project. We have strict deadlines and basically no time, but what’s most important is that we’re selling our new process. In a nutshell, our new process is all about making prototypes early on and testing on end users from start. We have decided on that we will be working in small 8 week sprints with dedicated user scenarios, that we will solve and focus on. 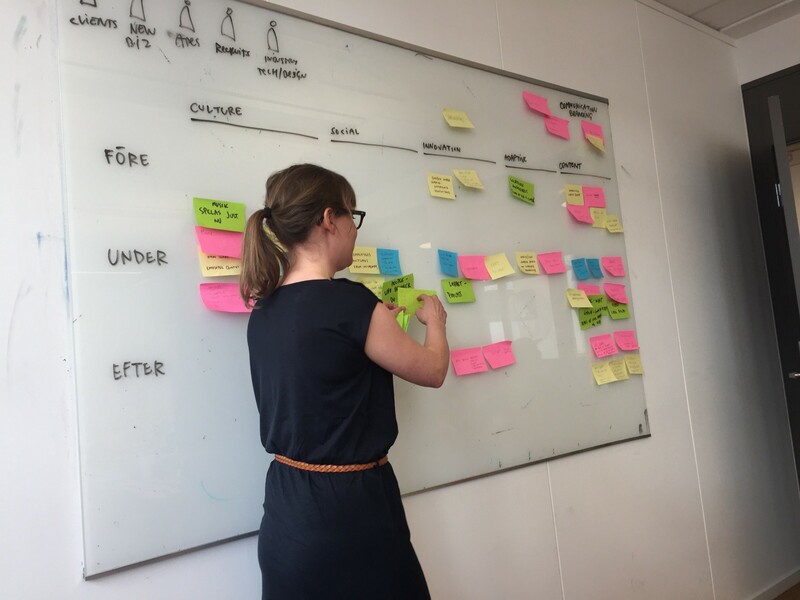 This design sprint, the initial one, is focused on communication and sales. Our target user are clients, new business. And we call it “Sell me this pen”. At the end of every design sprint we will have a fully functional prototype that will be released into the wild. At the moment we have a Wordpress website based on Semplice that will serve as our prototype and will replace the current Apegroup website in 4 weeks when this sprint is up. We also have a plan to do release a version of the prototype at the end of every week. This blog will try to capture just that. Work — Where we list cases, clients and referrals. About — The story of Apegroup and where we are headed. Culture — Employees, our office, clubs, songs, happenings. All in one big grid with animations on top. Innovation — This is the new addition to the site. Experiements, hackathons, innovation pushes for clients. It will all be here. We are focusing solely on clients for this iteration. We set up a couple of scenarios for different client needs where each and everyone of them was a funnel where we deliberately pointed our visitors to what we offer. Gunner, our copywriter posing wth the scenarios. With the hopes that everybody will be amazed by our work, we also saw to it that it will be really easy to spot the next natural step as a possible client… To contact Apegroup. We basically sold out and looked at our whole website as e-com where every action should lead to conversion. We don’t call this sprint “Sell Me This Pen” for nothing, you know. 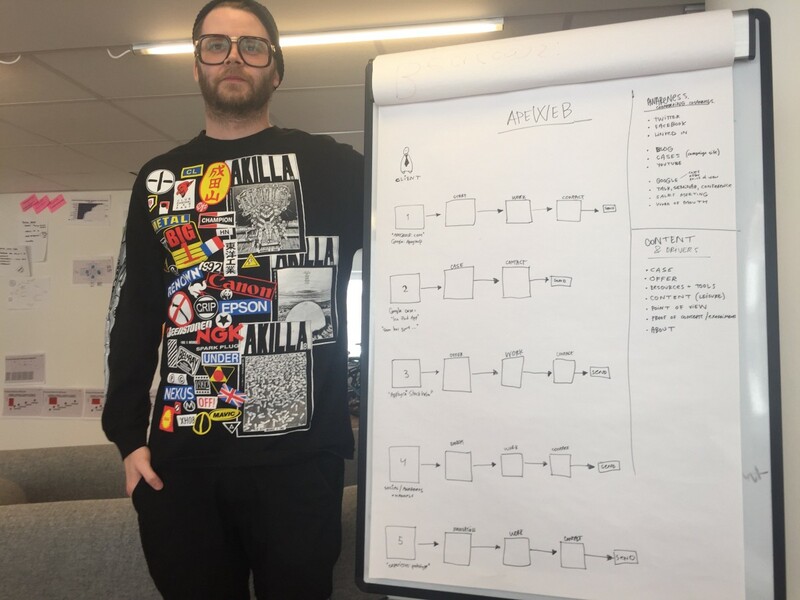 Nils crashed a weekly design meeting to host an ideation workshop about agency websites and how we can differentiate ourselves in that area. Let’s be honest, all agency website look the same with the obvious exceptions of Rally Interactive, Wild and Hello Monday. So, we asked our designers to come up with ideas on how we can attract visitors in new ways and how we can stand out in the crowd. We based the ideation on five pillars: culture, social media, innovation, adaptive content and owned content. These are the five things that we want to base our brand on, and what we will focus on when building the website. 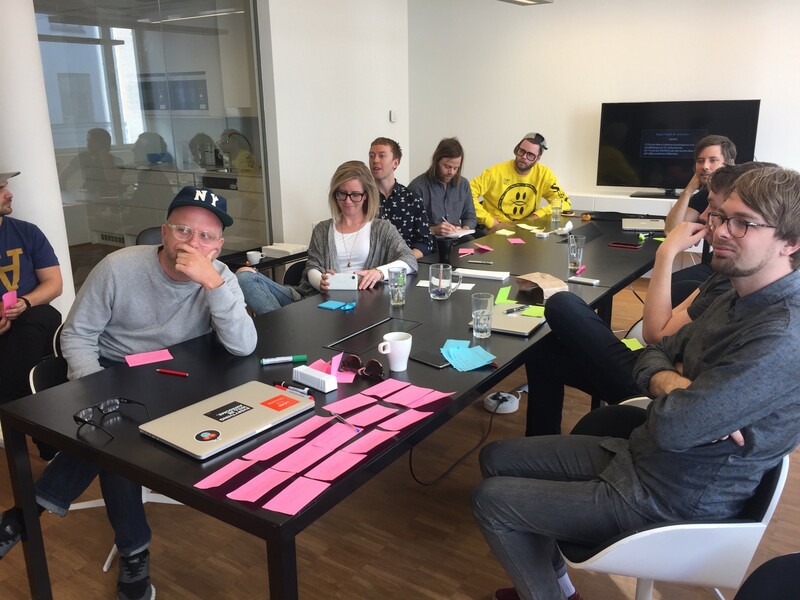 Josefin, Interaction Designer, presents her ideas to the group. Have three article lengths for every text and display one that fits the surfing behaviour. For example if a visitor stay a short time on two pages, we show a very small text on the next page. Make all the articles adapt to the user. Embed prototypes on the site that you can interact with. InVision let’s you embed prototypes on web. Let’s show the people our work, not just the end result. Open Source our Sketch designs. Make all the designs for the website not only public but downloadable. Share the designs with the community. We have a lot of trouble with our elevator. Clients get lost, it’s super tricky to understand. Create a separate site apegroup.com/hissen where we explain how to operate the elevator for clients. Add it to any meeting invite. A Hornstull Lunch Guide. Hornstull is this very up and coming hipster area of Stockholm, the latest gentrified part of Söder. Most of us live here, and all of us eat lunch here. Let’s share that knowledge and build a lunch guide, to gain traffic. We have very limited resources for this project. Like seriously limited. We are four people that have gotten an allocation of four hours per week. The only way we can do this is to totally focus on this project, without any distraction, for every Friday afternoon. This has proven difficult. First off, our AD Christian is incapable of planning his time so he’s not here as much as we would like. Second, Nils is always planning things for Friday afternoons like cutting his hair and going on Holidays. Not acceptable! 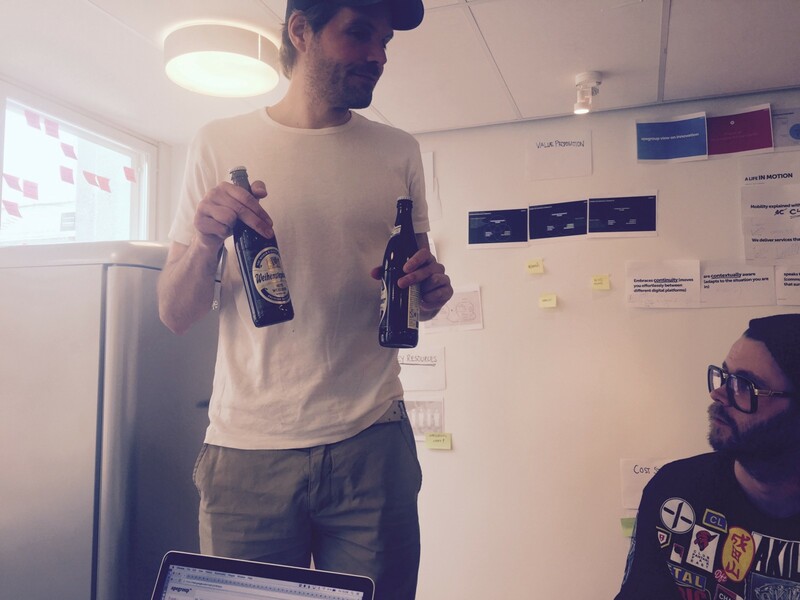 Jonas, Chief Innovation Officer at Apegroup hands the team a cold one. We’ve also taken to drinking wine and beer during our meetings, which has both its upsides and downsides. Todays upside is that we’ve planned for a web shop where we will try and sell the idea of the Inner Kinder Egg for 1.4 million. The downside is that we were supposed to do something completely different… However we have decided to give the drinking a last chance next week. We’ll keep you posted. Until next time, god speed.